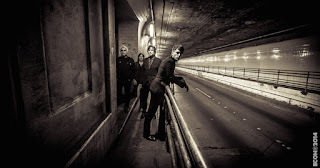 Background promo - Brooklyn-based Heliotropes have released the official audio for 'Normandy,' the second track from their upcoming album Over There That Way, out July 15 via The End Records. 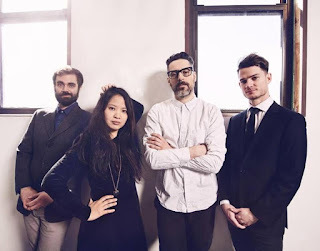 Heliotropes is comprised of founding member/songwriter/vocalist Jessica Numsuwankijkul, along with a rotating cast of collaborators, including drummer Gregg Giuffré, bassist Richard Thomas, and guitarist Ricci Swift, who are all featured on the band's upcoming album. Bin Juice - Astro Surf. 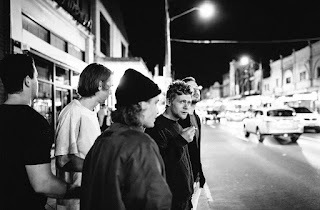 Background Info - We are delighted to share the news of Sydney 5 piece Bin Juice signing to Monday Records, and announcing the recording of their debut studio EP. Bin Juice is just the right dose of Funk, Psych and a live set that leaves every punter talking for days. Their signature song-writing centres around their love of jamming, organically spurting out addictive melodies they then turn into songs. Described as “a force to be reckoned with”, Bin Juice ticks all the right boxes, from clever lyrics to electrifying riffs. The boys have developed a seasoned reputation for high-energy performances and drawing a pumping crowd wherever they play. Bin Juice has played alongside bands such as: Flowertruck, Winston Surfshirt, Capital Coast, Raindrop, Salvador Dali Llama, White Blanks, Powla, Bad Valley and Phantastic Ferniture. Background promo - Vacation, the forthcoming EP from Papertwin via Druyan Records represents their third studio collaboration. 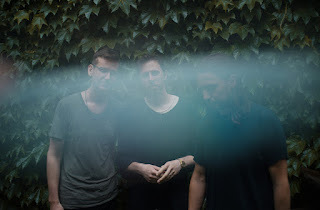 Self recorded in their New York apartments and mixed by Abe Seiferth (yeasayer,DFA Studios), mastered by Heba Kadry (Neon Indian, Beach House) the EP continues the band's unique sense of synth-pop. Dreamy, dark, nostalgically sci-fi, Vacation features analog synthesizers, melodic guitar lines, driving percussion, and reflective vocals. Drawing on influences from The Cure to Gillian Welch, this EP builds upon the bands previous recordings. The Scenics - Wild Trout. 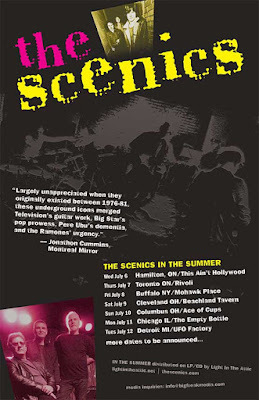 The Scenics were artistically amping up, and making recordings as a fiery young band. These songs were never released back in the day, but now they are collected on In The Summer. They played shows with Talking Heads, Simply Saucer, The Troggs, and dozens of other pivotal underground legends. In Letter Form - Face In The Crowd. Background promo - Drawing influence from the works of The (early) Cure, Joy Division, Bauhaus, New Order, Echo and the Bunnymen, Interpol et al, they produce a sound that echoes the past, haunts the present and is constantly in the future. 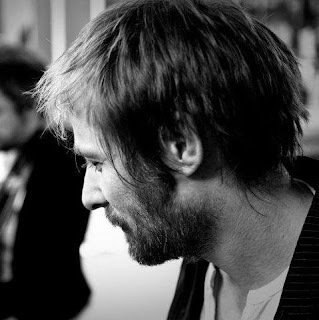 Background promo - Hailing from Sydney, Mary and Chris are Polarheart. The duo began writing together in early 2013. They found a strong chemistry, and a year later Polarheart was born. Their combination of dreamy vocals and abstract soundscapes, makes for a captivating listening experience. 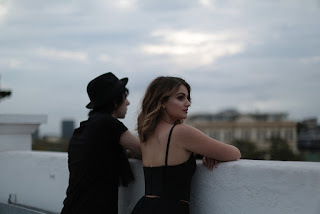 After four successful singles and months of writing and recording, the Sydney duo are set to release their much anticipated self-titled debut EP in mid-2016. Peter Vogelaar - Television (Feat. Ken Lally). Background promo - Peter Vogelaar is a bass player & producer from Waterford, Ireland. His new album 'The Science Of Summer' features collaborations with Deaf Joe, Katie Kim, Cat Dowling, Ken Lally, Susan O'Neill & Aisling Browne. "I wanted to make an electronica/folktronica album, loosely conceptual, that tries to capture the energy and atmosphere of a summers day. The real obstacle was trying to give the album a continuity with all these guest vocalists who had their own personality and flavour. BANFF x Caitlin Park - My Love, My Lover. 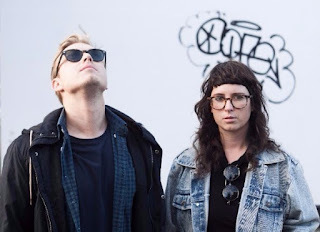 Background promo - Brisbane singer-songwriter BANFF (aka Benjamin Forbes) and Sydney subtronica artist Caitlin Park have teamed up to release their debut collaborative single ‘My Love, My Lover’ – released Friday, May 20 via London-based singles club 0E0E. Incredible lyricism is the craft of both singer-songwriters, who have together shaped a spacious, soul-drenched indie-pop song. The song tells the story of a disrupted relationship - exploring the dialogue between a confused, apathetic young man with his head in the clouds and his compassionate but at times over-committed girlfriend. But in the end, an all over sense of unity and strength between that pair is revealed, as they realise they would inevitably be OK.